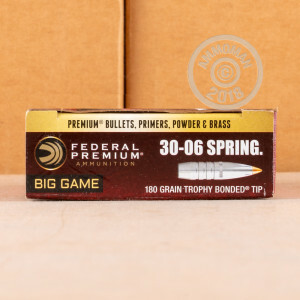 Take advantage of Federal's Trophy Bonded Tip bullets to gain an edge when hunting for deer or other game. These Vital-Shok .30-06 Springfield cartridges fire a 180 grain bullet at a muzzle velocity of 2,700 feet per second. The Trophy Bonded Tip has a polymer tip that delivers excellent aerodynamic performance and initiates expansion upon contact with the target, forcing the small lead core to expand into a high-diameter mushroom. The projectile's solid copper shank enhances its ability to penetrate and knock down game quickly. 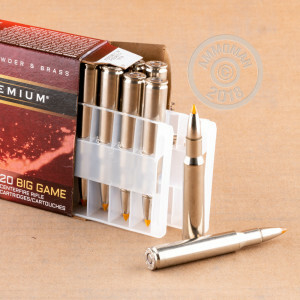 This ammunition is loaded in Anoka, Minnesota using non-corrosive Boxer primers and nickel-plated brass cases. Each box contains 20 rounds.